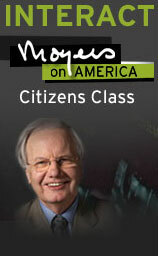 FOR UPDATES FROM JULY, 2008, check out the BILL MOYERS JOURNAL site on "Capitol Crimes." "It's a dizzying scope of perfidy and politics that boggles the imagination, and although Jack Abramoff and Tom DeLay have been brought down, the system remains as vulnerable as ever," says Bill Moyers. "The scale of corruption still coming to light dwarfs anything since Watergate. In one sense it's the age-old tale of greed, but greed encouraged now by the way our system works. Deep in the plea agreements of Jack Abramoff and his cronies is the admission that they conspired to use campaign contributions to bribe politicians; campaign finance is at the core of the corruption. They took great pains to cover their tracks, and they might have pulled it off except for a handful of honest people, and the work of some enterprising print reporters, Senate investigators, and the ethics team at the department of justice. Following the money in this story leads through a bizarre maze of cocktail parties, golf courses, private jets, four-star restaurants, sweatshops - and the aura of chandeliered rooms frequented by the high and mighty of Washington." 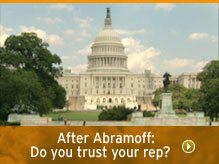 The ramifications of the Jack Abramoff scandal continue to mount. Since "Capitol Crimes" was broadcast in October 2006, Jack Abramoff started his prison sentence, and U.S. voters in exit polls named "corruption" as the biggest factor in their ballot-casting - above terrorism and the economy. Indeed, association with Abramoff was cited in the defeat of at least two incumbent Republicans - Representative Richard Pombo of California and Senator Conrad Burns of Montana. Jack Abramoff may not be the only one heading for jail. Former White House budget official David H. Safavian was sentenced in October to 18 months in prison for lying about his relationship with Abramoff. Ohio Representative Bob Ney (R-Ohio) was sentenced in January in accordance with his October guilty plea to corruption charges to 30 months in prison and has reported to prison. (Ney resigned his seat on November 3, 2006.) An aide to White House advisor Karl Rove also resigned after her ties to Abramoff came to light in a House Government Reform Committee Investigation. And these may not be the last casualties. The Justice Department wanted to keep Abramoff out of prison so he could more easily aid in yet another large corruption case. Another Congressional report may cause tax status trouble for nonprofits associated with Abramoff. A report by the Democratic investigators of the Senate Finance Committee details how five nonprofit groups including, Americans for Tax Reform, Citizens Against Government Waste, the Council of Republicans for Environmental Advocacy, the National Center for Public Policy Research and Toward Tradition, eased access for Abramoff clients to administration officials and concealed the source of funds used for Congressional travel. The report alleges that some of the nonprofits officials "were generally available to carry out Mr. Abramoff's requests for help with his clients in exchange for cash payments." Just after the mid-term elections the newly empowered Democrats came out with promises of reform. Incoming Speaker of the House Nancy Pelosi put forward a proposal to greatly restrict privately paid travel from lobbyists and groups that hire lobbyists. A variety of interest groups have come out in opposition to a total ban - tracing the impetus behind the move to the abuses rampant in the Abramoff scandal. Earmark reform is also high on Speaker Pelosi's agenda - reform that was promised by members of both parties before the election. Already some skeptics are wondering if the process of pork barrel spending really will be eradicated in the new session. THE NEW YORK TIMES reported in November on the biggest Democratic suppliers of earmarks - breaking down their appropriations per capita for constituents. Among the top deliverers of dollars -- Senator Daniel K. Inouye of Hawaii with $746 per state resident. Inouye is now the chair of the defense appropriations committee. Senator Robert C. Byrd of West Virginia has been called the "King of Pork" by his critics - is now the head of the full Senate Appropriations Committee. In search of specific information? Just browsing? Select topics below to explore a range of issues, from Congressional ethics to the growth of lobbying in recent years to proposals for changing the system of money and politics in America. In our resources section you'll find essential documents and sites for further research. Visit Watch & Listen for Web-only video and audio and excerpts from the Moyers program archive and the complete show. Read the transcript of "Capitol Crimes." Should Congress be allowed to set its own ethic rules and police itself when it comes to ethics matters? How would you reform the American political system? Can you envision a healthy democratic system without some form of organized lobbying?